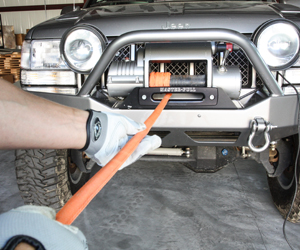 This guide explains how to properly install a synthetic winch line on a winch. Proper installation ensures that your winch line will perform at its best and will keep the winch line from getting damaged. After you have removed the steel cable and roller fairlead from your winch, it is a good idea to inspect the drum to make sure there is nothing sharp that can damage the rope after it gets put on. Make sure the drum does not have any sharp burrs or gouges as steel wire rope has been known to damage the drum. If so, file/sand down any sharp edges until the drum surface is smooth. Installing a new fairlead needs to be completed before spooling the rope on. Aluminum hawse fairleads work very well with synthetic winch lines as they provide a smooth surface that will not damage the rope. Many cast steel hawse fairleads do not have a smooth enough surface for synthetic rope and are not recommended. Steel roller fairleads are perfectly fine to use, just make sure that the rollers are smooth and not burred or gouged. 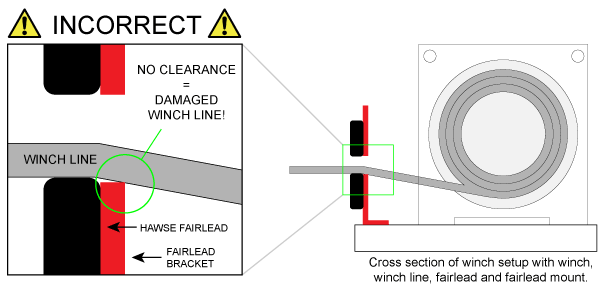 Also make sure that the rollers overlap each other as some older roller fairleads do not have overlapping rollers and have a gap in the corner of the fairlead. A winch line could get caught in this gap during use and get damaged. Regardless of the fairlead type, you want to assure that there is enough clearance between the opening of the fairlead and the edges of the mounting plate. 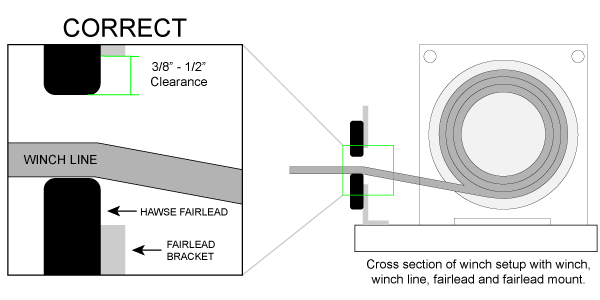 As shown in the diagrams above, we recommend at least 3/8" to 1/2" of clearance. Without this, the winch line can get cut on the sharp edge of the fairlead plate. 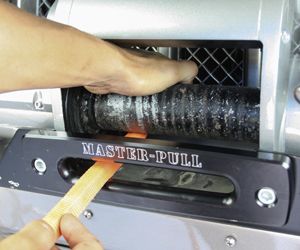 Before removing the old line from your winch, take a look at how it was attached to the drum. Most off-road winches will have a threaded hole on the drum flange that you attach a wire rope or synthetic winch line to with a button head allen bolt. 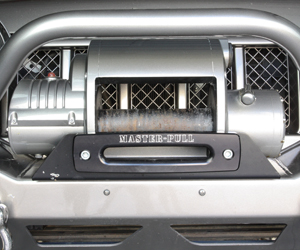 Other winches, such as the Warn Zeon series or 8274 have different methods. 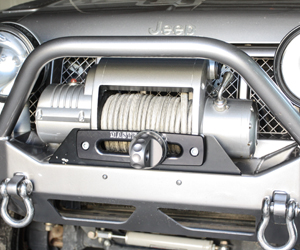 Take a look at the different styles below to properly attach your winch line to the drum. The Superline (8mm and 10mm) and Classic (8mm, 9mm, 11mm) winch line have a small-diameter Dyneema loop spliced to the drum end of the line that you use to attach to the winch drum. The provided drum kit includes a 1/4-20, M6 and 5/16-18 button head allen bolt for use with different drums. Choose the one that fits your drum and attach the line as pictured below. If you are using the 1/4-20 or M6 bolt, use the provided nylon washer to get some extra grab on the drum attachment. The Superline XD winch line has a Vectran loop sewn on the drum end of the line that you use to attach to the winch drum. The provided drum kit includes a 1/4-20, M6 and 5/16-18 button head allen bolt for use with different drums. Choose the one that fits your drum and using the the stainless steel washer attach the line as pictured below. It is easiest to flatten out the sewn loop with a rubber mallet or hammer so that it fits nice and flush on the side of the drum. The Superline (8mm and 10mm) and Classic (8mm, 9mm, 11mm) winch line have a small-diameter Dyneema loop spliced to the drum end of the line that you use to attach to the winch drum. The provided drum kit includes a circular aluminum wedge that that secures the line to the winch drum. First step is to run the drum attachment through the slot in the drum as pictured below. Next, insert the aluminum wedge into the larger eye on the winch lines drum attachment. Finally, pull the wedge and drum attachment back into the drum slot making sure that the drum attachment sits nicely on the wedge. The Superline XD winch line has a Vectran loop sewn on the drum end of the line that you use to attach to the winch drum. The provided drum kit includes a circular aluminum wedge that that secures the line to the winch drum. Next, insert the aluminum wedge into the eye on the winch lines drum attachment. The Superline (8mm and 10mm) and Classic (8mm, 9mm, 11mm) winch line have a small-diameter Dyneema loop spliced to the drum end of the line that you use to attach to the winch drum. The provided drum kit includes a 5/16-18 allen bolt and nut which will be used to secure the line to your 8274. First step is to open up the side access plate on the winch drum and then insert the winch line drum attachment into the hole in the drum. Next, pull the inserted drum attachment through the access hole and secure the 5/16 allen bolt and nut to the small eye on the drum attachment as shown below. Now pull the slack from the drum attachment, re-install the access plate and begin spooling your winch line. Here is another shot at how the bolt should be installed on the drum attachment. For the Superline XD, use the same method as above for Superline winch line, but instead of securing the drum attachment with the allen bolt, use the u-bolt that came with the the 8274. 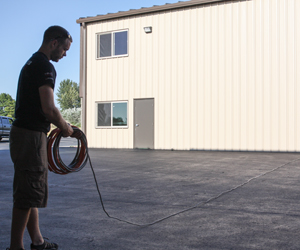 Before you begin to spool the winch line onto the winch it is a good idea to uncoil it and lay it out on the ground. This makes it easier to spool the line on. Insert the terminal end of the winch line through the fairlead and feed the winch line underneath the drum and over the top to the mounting point. Using the correct method above, attach your winch line to your winch drum. 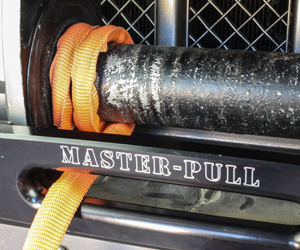 All Master Pull winch lines come with a heat guard that covers the rope on the first drum wrap. It is important to use this guard on the first wrap around the drum as it protects against abrasion and potential heat from the drum. Keeping your hands clear of the winch, guide the rope in making sure the wraps are neat and tight. It is helpful to have two people at this point, one to guide the rope in and one to work the winch controls. 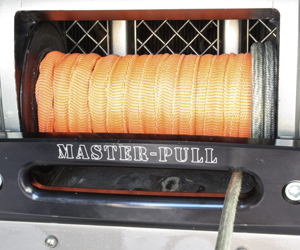 The orange heat covering should go all the way across the drum and it is very important to always have a full layer of rope on the winch drum while winching to assure the winch line stays attached to the winch. The friction from the wraps are what keep the rope attached to the winch. This photo shows the layers of rope stacking up on the drum. 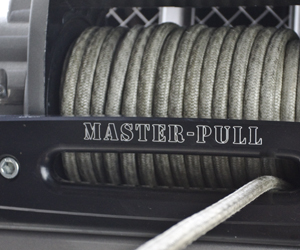 A neat set of wraps will function better and allow you to put more rope on the winch. As stated before, it is best to have two people to install a winch line. It can be difficult to simultaneously guide the winch line in correctly and handle the winch controller. Here you can see the finished product. 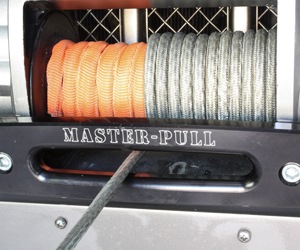 It is a good practice to unspool the entire winch line after every use and respool it properly.